Ronda webcam or Ronda web cam are digital cameras directly connected to the Internet. Some people also refer to these web camera as web cam Ronda cams. From Malaga on the Costa del Sol you travel 60km inland and you find the historic and visually stunning town of Ronda in the mountain range of the Serranía de Ronda. Ronda is very popular for day excursions from the beach resorts of the Costa del Sol – it makes a pleasant change to escape the heat, get into the mountains and experience the real Spain. The major sights of Ronda include: The Puente Nuevo (New Bridge) and the Plaza de Toros (Bullring) of the Real Maestranza de Caballería de Ronda (Royal Riding School of Ronda). Ronda travel and weather webcams are constantly transmitting and streaming live video, pictures and images of Ronda that you can see from your computer wherever you are in the world. Please help us by suggesting any Ronda webcams that you know of in order to build our list of webcams in Ronda. 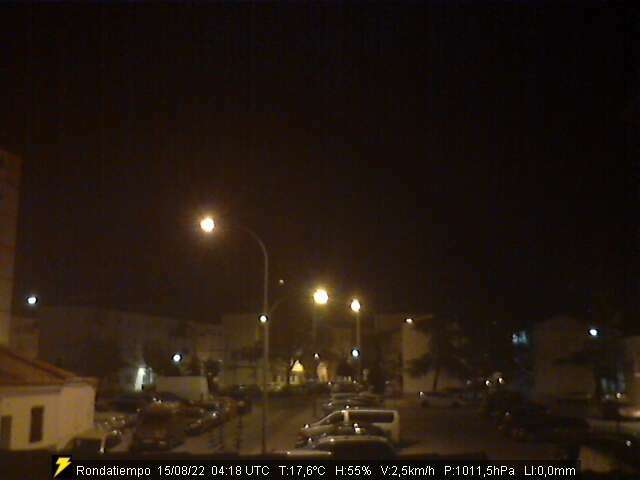 Ronda Webcam – Click on this webcam to see exactly what Ronda looks like in real-time. Admittedly not the prettiest views of Ronda but ou will be able to see the weather conditions as well as a detailed weather forecast with current and forecast temperatures. Ronda webcams are great for people who have never been to Ronda and who want to see what Ronda looks like.